The Southend of Wexford Town is bounded by King St to the north and Rocklands to the south, and comprises an area of around 1000 households. The Southend Community Development Group was established in 2001 by a group of local volunteers, formed in response to a perceived lack of community services and facilities in the area. They believed that they could make a difference to the lives of people in their community. Working with Wexford Local Development, they set up the RAPID Team for Southend in 2005 and one of their first achievements was the establishment of Maudlintown Community Playground. 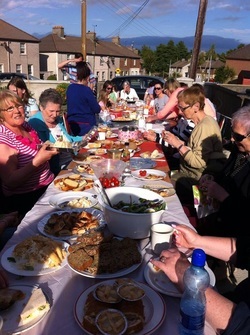 The Group secured funding from the Family Support Agency and so the Family Resource Centre opened its doors in 2006 in the humble surroundings of a small rented apartment above the shops at the top of The Faythe, Wexford. The Management and Staff could now implement a range of programmes and activities at the Centre.The Centre was officially launched in May 2008, by then-minister for Social and Family Affairs, Mary Hanafin TD amid great local celebration. We are now located at the top of Hantoon Road, in a building which was developed over the past year from a former private residence. Special thanks are extended to Co Wexford VEC, which made the development possible through a capital grant from the Young Persons Fund for Services and Facilities. It is the culmination of over a decade of hard work and determination on the part of local people to now have a permanent home for the FRC. It is home to a range of community groups, a meeting place and a source of information and support for individuals and families from the Southend Area. The Centre is run by a Voluntary Board of Management, comprised of local residents who represent the diversity of the community it serves. This ensures that what takes place at the Centre is informed by and responsive to the members of the community. Our aim is to work with families and the community to identify and tackle the causes and effects of unemployment, poverty and social isolation. By working with people of all ages and stages in life, we support families to build a healthy and thriving community. Much of the activities in the Centre are based on groups, which allows people to come together and build strong social networks and support structures. We Are one of 106 Family Resource Centres nationwide, and are funded by the Department of Children and Youth Affairs through the Child and Family Agency, known as TUSLA. The Centre is open to drop-in to any weekday morning from 9.30 to 1pm. At other times please call to ensure that somebody is available to see you. Some of our groups and activities also take place in the evenings and night-times, as well as off-site (e.g. in the local school), due to space restrictions with our current premises. We can be found at the top of Hantoon Road in Maudlintown, Wexford, at the junction with Gulbar Road. This is just off Maudlintown Green / Playground and opposite the Senator Windows unit.